World-wide, tree dressing is an activity that links communities to ancient sources of power, food and shelter. Today it’s also a winter event that brings fun and an appreciation to the modern UK dweller. Around the world, tree dressing has ancient and deep-seated links to community lifestyles. In India, several kinds of tree are worshipped as part of the Hindu belief system: the Tulsi, Peepul and Bael (or Bilva) trees in particular have honoured status for their ability to provide food, shelter and medicines – these trees are considered to be sacred to a particular God (the first two to Vishnu and the last to Shiva) and during the ‘winter’ or non-productive season will be painted with turmeric and red paint to offer thanks to the tree and as a prayer to the God with whom they are associated. Veneration of such trees has, of course, not prevented large scale deforestation of parts of India. In Provence, France, on May Day, May trees are decorated. 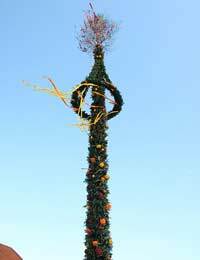 In some villages a tree will be felled (usually a Poplar) and used as a maypole for a festival of dancing while in others it seems the villagers went out and dressed the trees with ribbons and flowers. While this practice has largely died out, there are attempts to revive it as an environmental tourist attraction at a time of year when there are few other festivals. In Russian folk belief Zelenye sviatki was the seventh (or eighth in some places) week after Easter – the words translate as green yuletide and activities included finding a birch tree in the forest which would be dressed with ribbons and beads. In some places the tip of the tree was bent down to the ground to transfer the power of growth to the soil, in others the tree was cut down and dress up like a young girl before being thrown in a local pond or lake to encourage it to produce good fishing. In all these cases the tree dressing was designed to achieve fertility or to recognise the role of a specific tree species in the life of the community. Because they are species specific practices they are not like the modern form of tree-dressing which does not discriminate between tree species. The charity Common Ground, reinstituted the idea of tree dressing in 1990, building on its work to use and celebrate the many trees that fell during the Great Storm of 1987. Since the charity reinvigorated the idea, it has become a central feature of the environmental programmes of many councils across the UK who use the first weekend in December as a celebration of the role of trees in the community. Modern tree dressing activities often take place in parks and focus on engaging children in the process of creating sustainable or recycled decorations (often made of wool, paper or ribbon and sometimes including candles) that are hung in the trees along with singing and dancing and other winter activities. It is very often the case that modern tree dressing is linked to the beginning of the Christmas season and Christmas markets are a common feature of many Tree Dressing events. In addition to community festivals, which may also include tree planting as a feature of the day, there are often artist-led tree dressings which attempt to integrate the role of art, often commissioned by a local authority, with community activities. In some places tree dressing is linked to wildlife with the provision of edible decorations for birds. For the modern tree owner, tree dressing can be a part of caring for garden or community trees. Pruning, feeding, and ‘winterising’ trees all help to keep trees safe through the winter. Deciduous trees should be pruned when the tree growth is dormant which is usually mid-November to mid-March. Winter fruit trees, in particular, benefit from the removal of crossing, dead or diseased branches and from opening out the centre of the tree by cutting out large branches that stop air circulation and can cause congestion. Reducing the height and spread of productive branches keeps the next year’s fruit within harvesting reach. After pruning, trees can be ‘dressed’ with fat balls and winter seed to encourage finches and other birds to use them through the winter months. For garden trees, the low temperatures and wind chill, along with shortage of water, can stress the plants, especially non-native trees and very tender varieties such as acers and maples, and hybridised weeping trees which are often very prone to wind damage. It’s good to much under a tree with a rich mixture of compost under leafmould or bark chippings – this enriches the soil, retains moisture and protects small root systems from frost blast where water in the root expands and damages the cellular structures of the tree below ground. Some soft-barked trees benefit from trunk wrapping – layers of sacking or burlap strips can be wound around the tree and secured by stitching. This can create a beautiful spiral pattern of dressing and also protects tree bark from rabbit and mouse damage during cold winters. If you use salt to clear garden paths, remember it may have a damaging effect on trees as the roots take up the salt and develop crisped edges to the next year’s leaves. It may be better to use sand to make paths safe near trees. @none - for goosberries;in order to conserve soil you will need to mulch the root area wuth garden compost. Have you fed yet? As you should give it a granular fertiliser in winter. Pruning and training is always helps for a healthy yield for both goosberry and pear trees. For pear trees sprinkle a general fertiliser about now. Last year my apple pear and gooseberry gave a poor yield , what food do you suggest if any. ?.